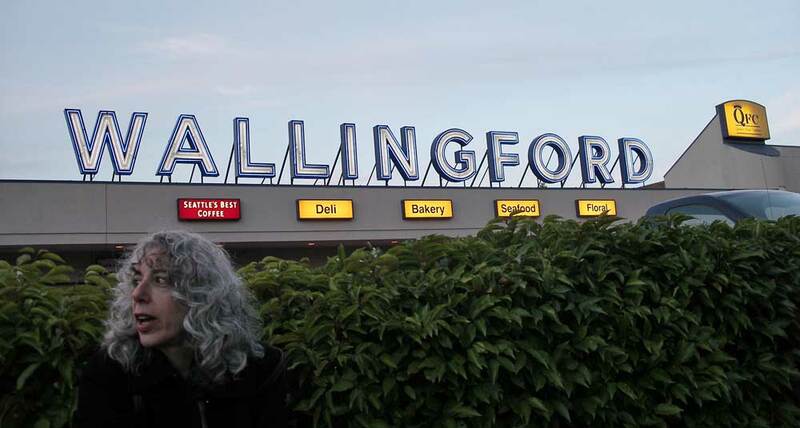 Big Sign reconstitution is something we in the Wallingford Neighborhood (in Seattle, Washington USA) know well. A few years ago our first supermarket with a corny name, the Food Giant, was purchased by Quality Foods (QFC), which might have reasonably disposed of its predecessors jumbo FOOD GIANT sign, but a clamor resounded from Interstate-5 to Aurora to save the neighborhood’s perhaps best example of iconic kitsch and keep alive its sentimental resonances. 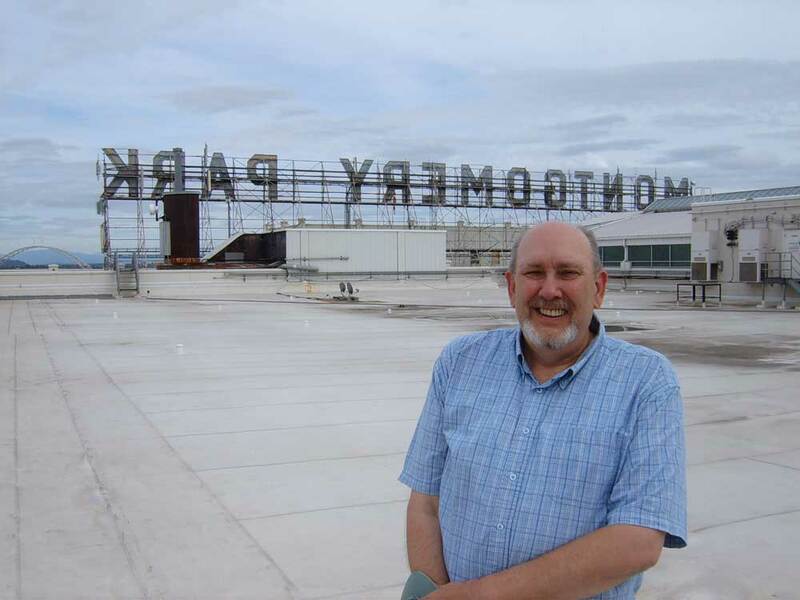 A poetic justice was derived when some local wit soon determined that from the oversized letters of “FOOD GIANT” once could easily, with a few additions and subtractions, write the name of the neighborhood – WALLINGFORD – and put it on the supermarket’s roof. And so it was. 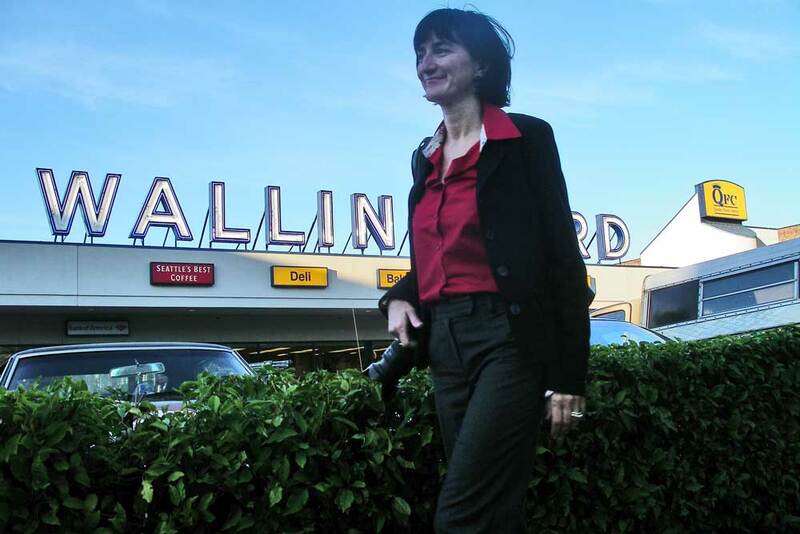 Here, appropriately, is Claire Sykes - who, again, took the photo of Richard Engeman before the Montgomery Sign - crouching before the Wallingford sign atop that neighborhood's QFC market on the evening of Oct. 27, 2008. Finally – or for awhile – the front of Food Giant/QFC is now being rebuilt two stories high and also extended south into the parking lot. This about 110 degree pan of the construction – imperfectly merged from three wide-angle shots – was taken on Oct. 19, this year. There is more on this parking lot and the structures that border it in our Seattle Now and Then posts. It is titled “Foodland” and appeared here February 8, 2009. 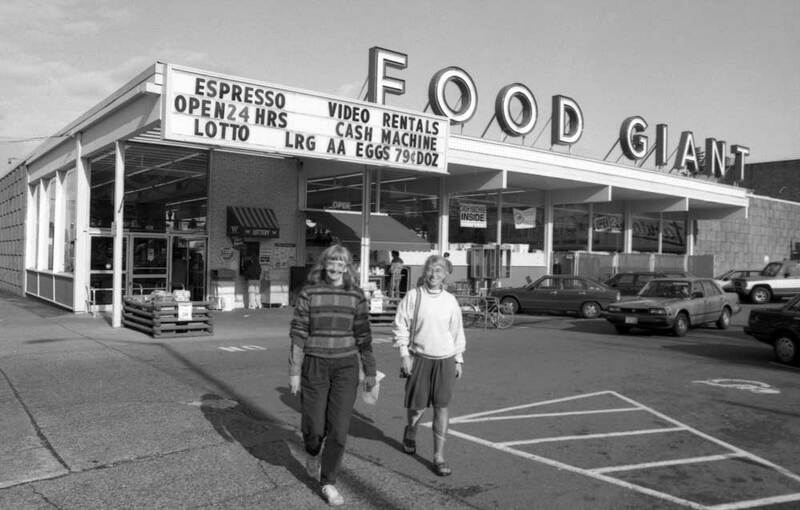 It is a brief history (non-current events) of the corner from WW2 to now: from Wald’s Market through Foodland, Food Giant and QFC Wallingford.